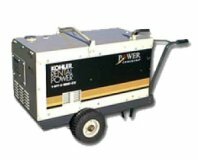 "Ultralight" electric power generators is a term used to describe several generator offerings that are very small in size and lightweight. These generators are generally aimed at the camping and outdoor recreation markets. Because of their size these electric generators offer very low wattage ratings, generally only enough to power a single device such as lighting, a television, or other small electric appliance. Additionally, these units are usually relatively quiet when compared to their larger counterparts making them ideal for use at a campsite. Most of these offerings are encased in a compact housing that includes a handle, and since they are fairly lightweight they can be easily transported by hand. Recently there has been a growing demand for ultra quiet generator products that make little or (relatively) no noise. The motor sound of electric generators has always been an inconvenience that was largely overlooked on emergency and home backup units because when you need these units, the noise they make generally becomes a low priority issue. There is a need for larger power units that are also "ultraquiet" or ""whisper quiet" so that these units can be used in environments where the additional noise of a traditional generator motor would not be tolerated. Such applications or customers include movie production companies, outdoor concerts and events, and jobsite applications within a suburban or urban environment that has stringent noise restrictions. These units can be of various physical sizes and rated outputs, from a small unit used aboard an RV, to a cart-sized unit, all the way up to very large trailer-mounted units with very large power outputs. In order to address these requirements several manufacturers have created specialty generator models that feature extensive noise shielding via an enclosure or cart, and superior muffler systems for the engine exhaust. Many of these same advances in "quiet technology" have found their way into the designs of standard home backup generators thereby improving these units acceptability greatly. If you have need for these units you will need to do some additional research to find the unit in the correct output with the desired noise rating. Pay careful attention to the rated decibel output levels advertised on different models, the rating should tell the distance (away from the noise source) at which the reading was taken. These distances can be quite different for units that appear to have a similar noise rating!